CII attaches a lot of importance to the development of Financial Markets in India. It has been the endeavour of CII to undertake policy-advocacy and engage closely with policy-makers to push forward the agenda of further developing the financial markets in India. 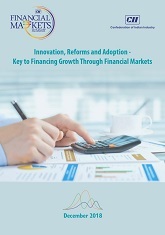 This is a compendium of articles on financial markets, prepared in line with the theme ‘Innovation, Reforms and Adoption - Key to Financing Growth through Financial Markets’. It has been prepared at the backdrop of the Financial Markets Summit held on 27 November 2018 at Mumbai.